I always knew that I was destined to be a designer, but not necessarily a graphic designer. In fact, I didn’t even know that graphic design was a “thing,” let alone a profession, until I was well into high school. My first love was with cars, and my dream job from as far back in life as I can remember – and for a very long time – was be the man behind their beautiful bodies. Ironically, the only place you couldn’t find a car around my house was in the garage. That was because – as of about my age of six – nobody in my family drove. My mom grew up in New York, where cars are basically useless, so she never learned, and she never had any real desire to learn after moving to more car-centric cities like Seattle later in life. My dad, who had actually been part of a competitive rally driving team in his younger days, had given up driving altogether after an unfortunate accident in our iconic orange 1974 Honda Civic. Nevertheless, my love for all things four-wheeled and engine-driven was powerful. I loved the sensuous, muscular curves (and that incredible fin) of the Jaguar D-type, the extraterrestrial aggressiveness of the Bertone Stratos Zero, the personal expression of a well-executed hot-rod, the ironic synthesis of opulent luxury and brutish utility of the Lamborghini LM002, and the still-unmatched innovation of the Citröen DS (way before the term “innovation” got raped and murdered by the MBA set, but that’s another topic). I even loved the simple purity of the original Volkswagen (despite its decidedly impure origin). I would pore over all of the reference material at my disposal, and I couldn’t ever wait to translate these visceral qualities into my own creations. 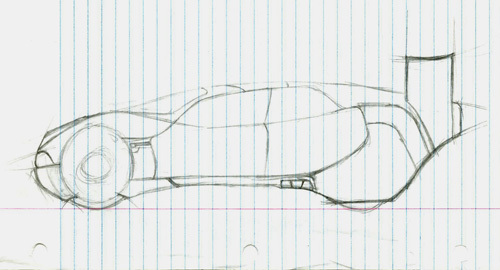 I drew cars incessantly growing up – one, two or maybe five different ones every single day. I would draw them at school, on the bus to and from school, at home after school, and at friends’ homes on the weekends. 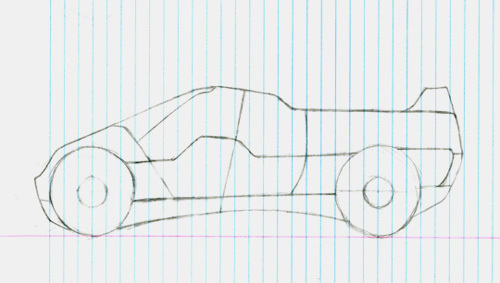 My medium of choice was pencil on paper – a No.2 pencil with a good eraser on top, and three-holed, college-ruled notebook paper, so I could get the proportion of the wheels correct and file them in my Trapper Keeper. ONLOOKER: (excited, curious) Hey, that’s a nice drawing! ME: (reserved, already knowing how this will turn out) Thanks. ONLOOKER: (skeptical) What kind of car is that, anyway? ME: (awkwardly) It’s my own kind of car… I just made it up. ONLOOKER: (annoyed, cheated, dejected) So, it’s not real? At some point, I lost interest in drawing cars, and the vision of shaping their skin faded, but it wasn’t because of these repeated, futile exchanges. I always knew in my mind that creation was more meaningful than reproduction, and this philosophy was certainly the seed for pursuing graphic design later in life. I never lost interest in beautifully designed automobiles. 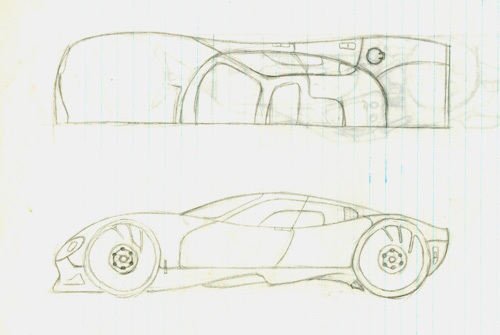 My priorities simply changed, as priorities often do, and my love of drawing cars shifted to the lust for actually driving them (among other things). 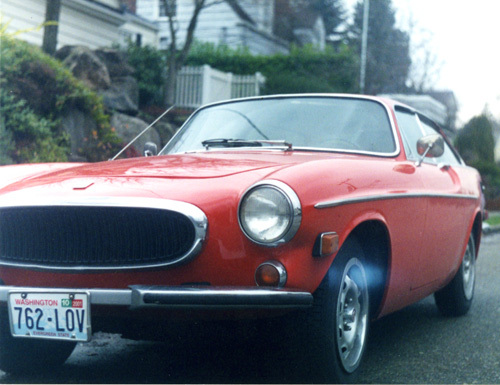 As soon as I could afford it, I bought my dream car, the only true sports car model ever made by Volvo (I even flew from Seattle to Las Vegas to get it). I’ve been lucky enough to have driven a number of other cars, too, and there are few things I enjoy more than throttling a howling engine from gear to gear and corner to corner. I imagine the thrill of street-bound freedom of velocity afforded by a real sports car can only be topped by a decent motorcycle. (Bicycling – especially competitively – can be quite thrilling, too, but the input to output ratio is radically different). But now I’m the one living in New York, and the dream is stalled. I am still moved by smart, powerful, or otherwise well-designed cars, but the possibility of me actually owning one any time soon seems far off at best, which is somewhat depressing. For anyone reading this, horrified at the ecological malfeasance of my desire for driving—just for the pleasure of it—in this time of environmental crisis, I can all-but-guarantee that my life has been infinitely less earth-damaging than yours. So, the next time I measure my “carbon footprint,” it will be on the floor of the fastest car I can get my hands on. I just hope they haven’t outlawed manual transmissions by then. The main thing wrong with cars is that there are far too many boring ones. They should be outlawed! If only interesting cars were allowed on the roads, they would be far less crowded. 1) Does the idea of operating the car get anyone excited? 2) Is the car Beautiful? 3) is the car Agile? 4) Is the car Powerful? 5) Does the car have an innovative approach to function that is not found in other cars? If the answer to 1) is “No”, the car is boring regardless of the answers to the rest of the questions. If the answer to question 1) is “Yes” then three more “Yes” answers saves it from the “Boring” category. Get the boring cars off the road and the automotive carbon footprint will almost disappear. The focus on interesting will give talented and creative people opportunities that largely don’t exist today. This may sound counter-intuitive, but I think that if people actually paid more attention to their cars, their ‘footprint’ would be far less dirty. There is a pervasive but false mentality that one’s car is a crucial element of their daily life. In fact, it’s quite possible for most people to get around without owning a car (even if they don’t live in NYC), and many alternatives to driving (especially driving alone) are far more efficient, safe, and healthy, and far less expensive. Nevertheless, most people view cars like necessary utilities – like electricity or plumbing. They don’t admit to themselves or others that car ownership and driving are luxuries that they can enjoy. If people were as passionate about their cars as they were about their fine China or their plasma TVs, they probably would not waste their money on ignorantly-conceived and poorly-crafted automobiles. Moreover, they would probably drive their cars far less frequently, and far more conscientiously when they did. This made me smile somany times I’m pretty sure I’ve seen all those drawings. I’m so impressed @ all your accomplishments my friend, Well Played Sir! Thanks so much, Charley. You’re the man.